Monday, April 8. Read Mark 1:14-15. 1) What stage of Jesus’ ministry is mentioned here? 2) What was Jesus’ theme or major point in his teaching? Tuesday, April 9. Read Luke 16:19-31. 1) Who are the two major characters in this Parable? 2) Describe each of these people? 3) What point do you think Jesus was making in this story? Wednesday, April 10. Read Luke 17:20-21. 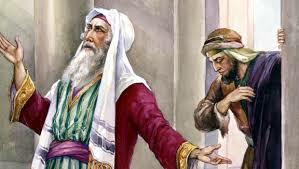 1) What were the Pharisees concerned about in this interaction with Jesus? 2) What was Jesus’ answer to them? 3) How do you think we see the truth of Jesus’ statement today? Thursday, April 11. Read Luke 18:18-30. 1) Who is the major character of this interaction with Jesus? 2) What does he hope to gain from Jesus? 3) Why was Jesus’ answer disappointing to him? Friday, April 12. Read Luke 19:1-10. 1) Who is the major character in this story from Luke? 2) What did Jesus tell him? 3) How did this person respond to Jesus’ teaching? So is there really something good about being judgmental? I know. I know. Nobody is supposed to be “judgmental.” It is the cardinal sin of Christians. And it is the response we get from non-Christians about every nod we make in the direction of hinting that some things are right — and others wrong. Especially with reference to the latter, we are reminded that judging is wrong. Other than the obvious contradiction in saying “Judging is wrong” — which is, of course, a judgment itself — it simply makes no sense to make an unqualified statement of that sort. We make judgments every day about drinking water, over rat poison, stopping at school crossings rather than running through lines of children, or telling the truth over lying. We even make judgments of others by deciding to work for a department store over a street gang or hanging around with law-abiding folks who like movies over drug dealers who kill people. “But didn’t Jesus tell us ‘Judge not that you be not judged’?” somebody asks. Of course, he did. But it was hardly an unqualified statement. He certainly made judgments about behaviors and people. He called some people “snakes” and others “children of the devil.” Sounds pretty judgmental to me. Jesus’ statement “Judge not that you be not judged” is from the gospel of Matthew in what we call “The Sermon on The Mount” (Matthew 7:1). It opens a paragraph about hypocrisy and forbids condemning in others what you may be doing too. It prohibits poking holes in the reputation of your neighbor when your own character needs work first. A fuller statement from Jesus on the matter of judging is this one: “Look beneath the surface so you can judge correctly” (John 7:24 NLT). Or, in the traditional versions: “Do not judge by appearances, but judge with right judgment.” This comes from John’s gospel (John 7:24) and it does not contradict the one quoted above. It says the same thing in different words: You must make judgments, so make good ones. At the start of a new year, it might help many of us to get clear on this judging business. It is simply a matter of distinguishing good from bad, right from wrong, commanded from forbidden. In order to stay on one side of the line that divides the two, you have to make some judgments. And why is this so important? “Judge not…” may have become the most abused and misused text of our time. It is thrown in the faces of people who often care enough about someone to hold him accountable for lying or drinking too much. It is the defense against being held accountable for doing wrong. Yes, some people are harsh and judgmental — in a bad way. They look for fault. They are quick to criticize. They seem to delight in another’s failure. On the other hand, I need people in my life who are accountability partners. They help me stay true to the things I say I believe. They keep me from getting too far off track. It’s a bit like having a sponsor in Alcoholics Anonymous — or a friend who cares about you. An open rebuke is better than hidden love! Wounds from a sincere friend are better than many kisses from an enemy (Proverbs 27:5-6 NLT).